In the past, the thought of making beans and rice for dinner was utterly and absolutely not exciting to me. I don’t know why. I think I’ve been ruined by the rush of making exciting recipes that aren’t made up almost entirely of beany beans (no offense to the humble legume). Enter my husband who has spent the last eight years begging me to make this dish since he enjoyed it every day when he lived in Brazil. I ignored him, like the loving wife I am. That is, until my 4-year old bought me a cookbook for Mother’s Day (that little dude knows his mother pretty well!) and when I let him pick out the first recipe to make – he chose black beans and rice. Big sigh. I couldn’t very well deny the tike when he was the one who gave me the cookbook. And now I owe my newfound love of this simple and classic dish to my 4-year old and my begging husband. This meal is so incredibly flavorful, it tastes like it’s been simmering on the stove for hours. Not to mention that it is cheap, healthy, and absolutely filling. It really is a one-pot wonder and is so very fantastically tasty! In a medium saucepan, heat the oil over medium heat. Add the bell pepper, onion and garlic and saute, stirring often, for about 15 minutes, until all the vegetables are soft and tender. Stir in the beans, tomatoes, chicken broth, thyme, bay leaf, oregano and water; bring to a boil. Reduce the heat and simmer, stirring occasionally, until the sauce thickens and the vegetables are tender, about 45 minutes. If the mixture becomes too thick, add a tablespoon or two of hot water to thin to desired consistency. Stir in the fresh cilantro and season with salt and pepper; discard the bay leaf. Serve over the hot rice. For an electric pressure cooker, use the Saute function to heat the oil. Cook the bell pepper, onion, and garlic, stirring often, for several minutes, until tender. Stir in the beans, tomatoes, chicken broth, thyme, bay leaf, oregano, and water. Seal the lid and cook on high pressure for 5 minutes. Quick release the pressure. If you want the mixture thicker, continue cooking using the Saute function until the mixture is thick (stir often to prevent sticking). Stir in the cilantro and season to taste with salt and pepper, if needed. Had the same problem I read someone else complain about. I made this in my Instant Pot, but it didn’t thicken at all. I even cooked it longer, no go. It was more like soup at the end. Any ideas what we might be doing wrong? Followed instructions, only deviated by adding kielbasa and cumin (we’re a cumin loving family and wanted more spice). Ready to try again, I really want this to work but no idea what I might’ve done wrong. Hoping you might have some idea? So good! Even my black bean hating kids approved! I just bought an Instant Pot and this was the first recipe I tried. Loved it! Easy, delicious and the only thing I changed was to add 1/2 tsp of crushed red pepper flakes for a bit of heat. Served over Basmati rice for a great meal. Yum! This was so delicious! And super simple. I made it in my instant pot and it was amazing!! Hi! The flavor is delicious, I made this but there was sooooooo much liquid. Was I supposed to drain the tomatos? I don’t drain them, but you can if it’s too liquidy (or continue to simmer – that could help, too!). This was SO good! I used only 1 can of beans and added kielbasa. It’s even better the next day! The notes were left out of this recipe – sorry about that. I just added them above in the directions. This was SO delicious! I only used 1 can of beans and I added cut up kielbasa. Family loved it!! So simple! I can’t wait for leftovers tonight! I was looking at your pressure cooker recipes since I received an instant pot for Christmas. I clicked on the link for recipes you thought would be easily adapted to pressure cooking. I’m a pressure cooker newbie. How do I adapt this recipe for the Instant Pot? Thank you!! I’ll add notes to the recipe (sorry they were missing), but you could use the Saute function for the first part of the recipe and then add everything else and use high pressure for 4 minutes. I want to cook the black beans in my IP without soaking instead of using canned beans. In other recipes you have cooked your beans with the tomatoes. I have always been under the impression that acid and sugar will prevent your beans from cooking. Little confused about what to do here. I usually cook canned beans with tomatoes, but you are right, sometimes cooking uncooked beans with tomatoes can prevent them from softening/cooking quickly. If you wanted to make this recipe in the IP with dried beans instead of canned how would you do that (or is that not recommended). I love, love, love this recipe! I’ve never made this as a main dish, but usually as a side for enchiladas, burritos, etc. It’s always a hit! A no-brainer when it comes to entertaining. I sub 1 tsp cumin for the thyme just because of personal preference. DELICIOUS! Leftovers always reheat well and, dare I say, taste better the next day! I also feel like I should mention that it’s AMAZING as breakfast, too! Reheat in a skillet and topped with a fried egg?! Yes x1,000. Thanks again for a keeper, Mel! Sending all the virtual high fives. So I guess since your husband requested this, you don’t have any advice on convincing my husband that a meatless dinner is a great idea. 🙂 Still haven’t been able to get him excited about that, maybe I’ll try Stacy’s version and add a fried egg, just to up the manly factor a little. Leslie, I added some cooked crumbled sausage (jimmy dean regular) and topped the servings with cheese……my men love it that way. I made this last night, it was a big hit! I added polish kielbasa, and it was so good! I didn’t have a can of chopped tomatoes, but used two large fresh tomatoes and it turned out great! Thanks Mel for your amazing recipes! YUM! I love black beans and rice, even though I’ve never been to Brazil. Does Costa Rica count? 🙂 I have a recipe that tastes very similar, but yours was easier. I added beef kielbasa to mine b/c that’s how we like it. Thanks for the great recipe! Hi! Just out of curiosity, have you ever considered adding sausage? I did, and it turned out amazing. I haven’t but sounds delicious! could you tell me the nutritional breakdown? specifically how many calories per serving? and what is a serving? 1 cup? You can google an online nutritional calculator for the information you need as I don’t provide that. The meal serves 4-6; I’m not sure exactly how much that is per serving in cups, sorry! I was wondering which one of your rice recipes – the Mexican Rice or Cilantro Lime rice would be the better choice to complement this recipe? Thank you. Melissa – My vote would be cilantro lime rice. My family loved this, even my picky daughter. There ended up being a bit too much liquid for our liking, so I thickened the beans up with some white rice flour. Great dish! Thank you! I made these last week with Quinoa instead of rice. It was delicious and I was kind of stunned because my kids ate it — even my picky-picky eater who cries every night at dinner. He didn’t cry that night. Guess what’s on the menu again this week. Thank you!!! Here’s what I do, and did today, actually! I cook about half a bag of black beans in water until they are soft – about an hour or two (don’t add salt or they will toughen). Rinse, then cool them, and store in 2 quart sized zipper bags if you’re feeding only 2 or 3 people like I do, then toss them in your freezer. A whole can of black beans is too much for us most of the time, so I freeze them in order to have smaller amounts to use in a variety of my recipes that call for them. Made these black beans and rice for dinner tonight . . .the family loved it! Thank you, Brian, for begging and thank you, Mel, for posting these in your “Recipes the World Forgot (Part 7)” series. I have made this with dried beans I cooked. You want them to be pretty firm but not hard in the center and not mushy at all. Just cook them a bit shorter than you normally would. And then follow the recipe as normal. This recipe is so good that it makes a regular appearance on our table. I use Fire Roasted tomatoes to add a smoky flavor. Hi Cearrow, I’ve never made these with dry beans so you’ll have to experiment – you might even try googling a recipe for black beans and rice made with dry beans. You’d probably want to soak them overnight and then cook them quite a bit longer with more liquid. You could definitely toss in cooked, leftover pork or chicken but if you are using uncooked, you could saute and cook it first before adding the beans (and maybe even take it out as the beans simmer, especially if they are simmering for a long time if using dry beans) and add in at the end. Good luck! My dad loves red beans and rice so I’ll have to try a recipe! This was super tasty! My kids loved it too! I have this on my menu for tonight but realized I won’t be home in enough time to simmer it due to kids lessons. Do you think it would be better to make it earlier and just keep on low on the stovetop covered or put in a crockpot on low after cooking. Other possibility is to keep it covered while it simmers to slow the process down which would add an extra hour with my timeframe. Hope that makes sense?? Thanks in advance! Katie – I think it would work quite well on low in the crockpot! This was a hit last night with me meat loving husband. We both had the leftovers for lunch today.Wonderful! My husband can’t/won’t eat tomatoes but loves black beans. Do you think I could use tomato sauce instead? Tiggerr – sure, I think that’s definitely worth a try. This was AMAZING! Only change I made was to use Fire Roasted tomatoes because that is what my hubby got for me. 🙂 But it was super good and filling. I also topped it with sour cream. Hi Mel! I just made this for my family and it was a hit! Very Flavorful. I added 1/2 tsp of red pepper flakes and a tiny dash of cayenne and it gave it a vey nice subtle heat. Thanks for the great recipes! This was delicious! I was very reluctant to make it because it sounded so boring, but I was looking for a meatless dish to make. So based on the comments I decided to try it. My husband loved this too and he didn’t even ask “Where’s the Beef”! Two additions I made was to add 1 tsp. of ground cumin and the juice of one lime. It really gave it the zing it needed! Served it with a dollop of sour cream and a slice of Texas toast. Very yummy and I love the cilantro in it! A tip I have for always keeping “fresh” cilantro on hand is to freeze it. When I buy a bunch, I rinse it well under cold water and then shake it until almost dry. Put the whole bunch in a ziplock freezer bag and stick it in the freezer until you need it. Then when it’s still frozen, use a scissors to clip off what you need, but don’t thaw it or it will turn to mush. It always tastes fresh. Thank you for the cilantro tip, Kathy! I put my cilantro in a glass with about an inch of water and cover the whole thing with a plastic bag from the produce area. Lasts up to 2 weeks this way. Don’t let the leaves get wet. Hi Jenny – the printable links work for me. What’s happening when you click on them? I can’t get the recipe print out links to work on this page?? I ended up just cooking it according it to directions and froze it. It froze very well! And it was a HUGE hit with our whole family. Including our three year old! I just made this for dinner for the first time, and we all liked it- even my picky 5 year old said it was good! 🙂 He also liked last night’s dinner, your Coconut Shrimp Curry! The only difference I made was to use 1 can of beans (I only had one on hand), and to simmer it for 30 minutes, since I didn’t have 45 minutes. It turned out great! Kylie – I’m not sure how it would fare in the slow cooker since I haven’t tried it. Sorry I’m not more help – but I figure anything is worth a try in the slow cooker. Let me know how it works out if you try it! Would this recipe work in the crockpot? I’m just trying to come up with some super fast crockpot/freezer/husband prepared meals for when our new baby comes in a few weeks. I don’t know if it’d work or not to get everything prepared, throw it in a ziploc in the freezer, so we can just throw it in the crockpot. It was good! I added green chili’s and chili powder, For spiciness! I just finished making this and had a small bowl to taste…YUM!!! I always think everything I make comes out just okay. But this came out amazing! Very flavorful. Don’t even miss the meat. Could make some chicken with it next time, but this is definitely a stand alone dish. Simply delicious! I followed a FB link to this page. I try to think up meals that go with black beans and rice, just so I can have them as often as possible. My version uses lemon and cumin, an awesome combination. I wanted to tell you, though, for a great consistency, I cook it for 20-40 min, stirring often, then smash some of the beans at the end with the back of a spatula. Soo good! Just made this tonight and it was delicious! We added a fried egg on top just like my husband used to eat in Brazil. Huge hit with the kidlets last night and I told them it was the kind of food people from Brazil eat, it seemed to get them eating and then of course the taste took over. Thanks for a home run on this one!!! I made this for dinner tonight. I used dried black beans, which I cooked completely first, and then followed the recipe as written. I served it over your Cilantro Lime Rice and it was DIVINE! I loved it. What more can a girl ask for than a recipe that is cheap, healthy, easy to make, and DELICIOUS? Thank you for a great recipe! Hi Melanie, super excited to try recipe. I am living in Senegal, West Africa and this dish will be super easy and super tasty cheap, good for you meal. Woot! Woot! So, excited to try it. I found your recipe last night and tried it today. It is soo good!! Since I had to soak my black beans I decided to cook it in the crock pot instead. That way the beans could soak and cook at the same time. This dish is really full of flavor! Mmm!! I will have to make it again!! Thank you for sharing your recipe! Mel, I wonder if you have a magic way to convert a recipe calling for a can of black beans into a recipe using dried black beans as I can’t find a can of black beans ANYWHERE in England. Wow!! This dish was AMAZING. Who knew beans and rice could taste that good?!?! Thanks so much for sharing – a new favorite dish in our house! I’m so glad you loved this one, Leslie! Just made this for dinner, and it was tasty! My kids loved it! (surprise, surprise…) Thanks for the recipe. Annie – love it when the kids love it! My bean mixture didn’t reduce for some reason, but even with that and without the fresh cilantro it was REALLY good! Shoot! I didn’t see the fresh Cilantro, in the ingredients list when I was at the store and left it out. Hopefully its still good. This dish was a hit with my husband, who usually will not eat a meal without lots of meat. He’s also extra picky about black beans because he lived in Brazil for two years. I was pleasantly surprised that he approved. In his words, “the cilantro and tomatoes make this taste fresh”. Thanks for sharing this super healthy, tasty meal! Smirking – my husband also lived in Brazil for two years and is a snob about black beans, too. I’m glad this meal won your husband over! Do you drain the tomatoes before adding them or add the juice as well? Dasha – don’t drain the tomatoes before adding them. We had this for dinner tonight- followed your recipe exactly and it was wonderful. My 4 year old LOVED it, my husband said he would like it again and I loved it too. Suzi – glad you liked this simple meal and I’m especially glad your 4-year old loved it. That’s a great success! I just came back to write down this recipe. We are having again for dinner tonight. Huge hit at our house. I have been meaning to try this and yup….good stuff! Kids loved it too. They said it tasted like Chipolte and asked for lime, sour cream and cheese on top. So that is what we had along with cilantro and green onions….this is going in the rotation of regulars for sure! Thanks and delish! Natasha – thanks for the great idea of adding lime, sour cream and cheese for some delicious accompaniments! Ha, Andrea – you are so funny! I have seen the movie Julie and Julia and that is a high compliment, even though I’m not half as talented (and cute) as Julie OR Julia. 🙂 Thanks for the smile and I hope you liked the black beans and rice! Thanks for this recipe- I love your blog! I made this last week and we absolutely loved it. Served it over brown rice. We had it for leftovers for several days after- my husband liked his with a fried egg on top like the way he always ate beans and rice in Venezuela where he lived for two years. It was delicious! Thanks again! Stacy – what a unique variation to serve this with a fried egg. Unusual but it actually sounds quite delicious! I made this last week. EXCELLENT. We loved it the night I made it and then devoured it as an after-church lunch. This will be a regular in our house, especially with the ingredients being so simple. Thanks, Whitney! I’m honored that with you and your husband’s culinary expertise, you would even want to try one of the recipes from here. Glad you liked it! This meal has become a staple in our home, too. Do you cover it when it is simmering? Brittany – no, I leave it uncovered while I simmer. It reduces more this way. You could definitely partially cover it but it might take longer to achieve the thick consistency. Damaris – thanks for including your changes! I’ve never used black sweet rice but it sounds intriguing. I made this the other night. I’m assuming it was wonderful, because I got up from the table for a few minutes, and when I came back it was ALL GONE! I didn’t even get to taste any of it. There have already been requests to have it again. This time I will stake my claim early, and double the recipe, just to be safe. Making this for dinner TONIGHT! It’s all done and simmering in the pot, and YUM. 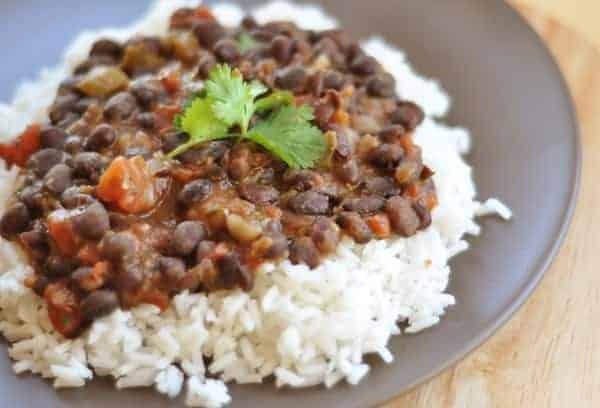 I served a mission in Colombia many years ago, and this dish reminds me of the same rice and beans I ate and loved there. I’m also going to try to fry some plantains and yuca to go with it. THANK YOU for a delicious rice and beans recipe. Jenny – I hope this turned out ok for you! The friend plantains and yuca sound so authentic and delicious! I had to tell you: I made this for dinner tonight. Hubby came home, looked in the pot and said “what is THAT!” with a frightened look on face. I replied, ” Dinner”…. turns out, he loves it, as well as my kiddos! It was good enough for a Facebook posting by him. LOL. I did switch the diced tomatoes for cilantro and lime diced tomatoes, added cheddar cheese and fat free sour cream. I forgot the cilantro though. My 5 year old girl asked to have leftovers tomorrow, “‘cuz I love this!” She is very picky!! If you ever publish a cookbook with all of your recipes, let me know!! Then I can replace the binder of print outs I keep in my cupboard 🙂 Thanks!! Jillian – I laughed at your comment because my husband has done that same thing on occasion – kind of turned up his nose to what was cooking on the stove and then ended up loving it. I’m glad this was a hit! Ooooh this sounds fantastic! I love black beans and I’ve been trying to find really good recipes that call for them. If this recipe is anything like the Weight Watchers Smart Ones Red Beans and Rice, then I’ll be sooooooooooooooooo happy! This was great! I didn’t have any black beans so I used dark kidney bean. I’m anxious to see how it tastes with the black beans. I noticed this was from a Weight Watchers book. How many points is it? Kim – glad you liked it with the dark red beans. Yes, it is a Weight Watcher’s recipes, but I adapted it quite a bit and I don’t know how to calculate the new points, which is why I didn’t include them. I increased some amounts in the recipe to give me a little more quantity and subbed ingredients here and there. I tried this recipe for dinner this evening. I loved it. A good recipe that does not use meat. It is a keeper ! Thanks. Nina – I’m so glad that you liked this! Thanks for letting me know. I loved this recipe. 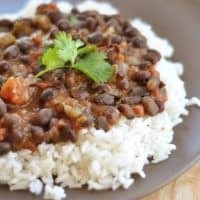 I have only had Red beans and Rice before and I am not a huge fan, but this version with the black beans was fantastic! Thank you for sharing it. Scoggdog – thanks for checking in to let me know this version worked out for you! I’ve never had red beans and rice – but I’m glad you liked this better than the other versions you’ve tried. Beans, beans… I love them! This recipe sounds like a great summer dish for when you want something filling without meat. I enjoy your witty sense of humor and beautiful pictures! I love that when I have no desire to cook, being 8 months pregnant, I can come here and find something quick, easy, and yummy! My husband has been loving life since I found your site! Thanks! I just need to find a bunch of recipes that freeze well for after the bundle of joy makes an appearance! I hate to admit it, but when we are really not in the mood to cook or go out, we skip 90% of the recipe and just combine one can of black beans and a half of a can of RoTel. This over brown rice is a lazy gal’s dream come true. Yours looks positively gourmet in comparison. My wife introduced me to your site, and I find it VERY refreshing. Love your humorous approach to cooking. It would be a joy to watch you in the kitchen. I wouldn’t normally think of beans and rice as great food, but after reading your recipe, that seems to have changed. I will be making this one for sure. And being a husband, don’t think for a minute that your husband didn’t point out that recipe to your unsuspecting son. And bribes could have been involved. THX again. my husband was born in brazil and this is a must for our house. I actually have my beans soaking right now. I will have to include some of your ingredients to my pot! You could try adding in some sausage or a lighter meat such as chicken or turkey!! i love dishes like this–it doesn’t take any effort on your part to convince me of its tastiness! i love the thyme in there–that’s a happy surprise. Add some fresh chopped tomatoes and some cashew for one of my husbands favorites. 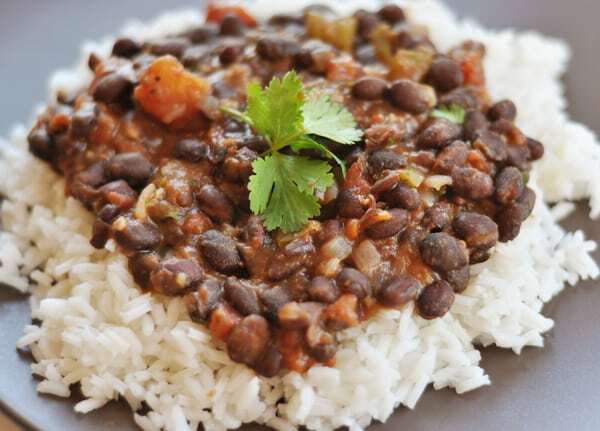 Beans and rice make a complete protein without meat. I confess I use pork and beans from a bag as well, but I am going to try to this one as we could use a meatless dish with flavor. I love black beans. Thanks Melanie! Ahhh… the famous beans and rice dish! I too lived in Brazil and married a Brazilian so this is a favorite staple in our house! Only difference is that we use a pressure cooker to make them, beans from the bag and pork products so that the beans get all of that yummy flavor! (Bacon, smoked sausage or even ham seasoning!) De-lish! My husband, who also spent 2 years in Brazil, is always asking me to make the same thing! I will have to try it! Thanks! And I know u know that black beans are high in fiber as well as brown rice… Black beans go well even sprinkled on a salad. The recipe doesn’t state when I add the vinegar, at the beginning or when it is finished? What kind of vinegar? Cider or balsamic? And I am not sure if I am commenting to Mel or the previous commenter, sorry- not sure how to do this. Hi Sally – I’m a little confused as this recipe doesn’t call for vinegar. Are you thinking of another recipe?